Anyone who is a slave to sin should prepare himself for true regeneration by means of faith. He must shake the yoke of sin off his back and enter the joyful service of the Lord. He will be thought worthy to inherit the kingdom. Don’t hesitate to declare yourself sinners. Thereby you will be put off your old humanity that was corrupt because it followed the bait of error. And you will put on the new humanity, the humanity newly clad in intimacy with the creator. God is kind and he is kind to an immeasurable extent. Your sins piled up one above the other do not overtop the greatness of God’s love. Your wounds are not too great for the skill of the Doctor. Cyril of Jerusalem, Catechesis (from Drinking from the Hidden Fountain). 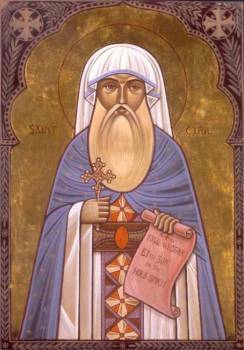 We think St. Cyril of Jerusalem lived between 313 and 386 A.D. 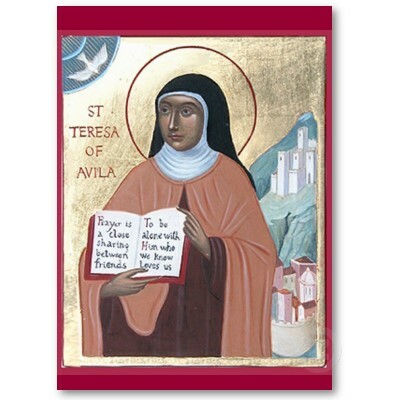 He has been venerated as a saint by the Roman Catholic Church, the Orthodox Church and the Anglican Communion. At a time of great strife and discord within the early Church, he worked for peace and reconciliation. 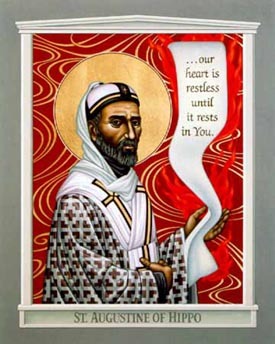 He became the bishop of Jerusalem, and was loved there for his works of charity (which included feeding the poor at the expense of selling the church treasury). I love this little piece of his, in part because it echoes one of the major themes of this blog: our capacity to sin can never outrun God’s deep and abiding love. The Cross teaches us how much God cares for us. We will never be able to reason, or to behave, our way into God’s love, which He pours out like a steady rain onto all of us. I hope we can all hear God’s voice calling to us, affirming us as His beloved. We can never go so far down the road to ruin that we cannot turn back, and our Father who sees us from a long ways off, will come running to meet us. As Cyril said, our wounds are not too deep for the Doctor to heal. Never. Never ever. I’m going to be taking a break from writing for a while. You will remain in my prayers, and in my heart. With such an aim I have done all I could, as one destined to the service of unity. God does not dwell where there are divisions and bad feeling. I exhort you: never give way to a quarrelsome spirit, but always carry out the teaching of Christ. Jesus Christ is my criterion. Unassailable grounds of judgment for me are his cross, his death, his resurrection and the faith that comes from him. Ignatius of Antioch, To the Philadelphians (quoted in Drinking From the Hidden Fountain). 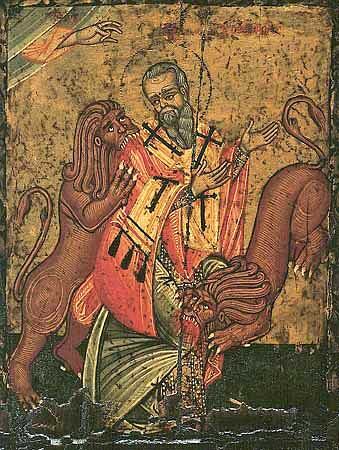 Today is the Feast of Ignatius of Antioch, who was born in modern day Syria in around 50 A.D., and died in Rome around 117 A.D. He was the third bishop of Antioch, which was then one of the centers of Christianity. He studied under John the Apostle. We don’t know a lot about him, because his ministry occurred so early in the history of the faith. We know about him principally through the seven letters he wrote that scholars consider to be authentic. He wrote at a time when being a Christian was a dangerous choice, and was accused of treason by the Emperer himself. He was a bishop, an apostle and a martyr for the faith. As we can tell from today’s reading, the subject of the unity of the faithful was a common theme in his writings. As I read this piece, I was struck by the notion that our divisions as Christians begin with our being divided as individuals. Most often, our petty disagreements arise from our competing loyalties to Christ and the world. When we are truly focussed on Jesus, the cross, and our faith, most of our divisions fade away. I pray we will someday learn to set aside our egos and live as the one body we are called to become. Jesus knew how difficult this would be for us. Thus he prayed, “I ask not only on behalf of these, but also on behalf of those who will believe in me through their word, that they may all be one. As you, Father, are in me and I am in you, may they also be in us, so that the world may believe that you have sent me.” I pray for the day when all God’s children become one in love. “And when he heard this, he was shocked and went away grieving, for he had many possessions.” In the name of the Living God, Father, Son and Holy Spirit. You know, if there’s someone in your life that you’d really like to get rid of, there are a number of ways to make them feel unwelcome. You could ask them to help you scrub the grout on your tile kitchen floors. Or, you could invite them out to dinner at the all you can eat liver buffet. Or, you could ask them to come to your parish and give a stewardship sermon. And so, when my good friend, your priest, the father of my godson, invited me here today, well, I took the hint. But we’ll get to that stewardship thing in just a bit. So this young man comes to Jesus and asks him, “Good teacher, what must I do to inherit eternal life?” Jesus replies with a stark statement: “No one is good but God alone.” Jesus begins by reminding him, and us, that God is the source of everything that is good. We acknowledge that in our liturgy every Sunday when we sing “Praise God, from whom all blessings flow.” Or perhaps we say, “All things come from Thee, o Lord, and of Thine own have we given thee.” The point in all three is the same: all goodness, all that is, comes from God alone. Jesus then tells this young man “You know the commandments: ‘You shall not murder; You shall not commit adultery; You shall not steal; You shall not bear false witness; You shall not defraud; Honor your father and mother. '” And the young man tells Jesus, “Rabbi, I have kept all of these commandments since I was a child.” Of course, Jewish tradition held that no one other than Abraham and Moses had been able to keep the law. This young man comes to Jesus mostly for an affirmation. What he wants, like what we want, is for Jesus to tell him that everything’s okay, that he’s doing everything he’s supposed to, and when it comes to him, eternal life is pretty much a shoe-in. That’s what he wants, and I think that’s what we want, too. But that’s not exactly what’s going to happen. The next line is often overlooked when we hear this story. “Mark tells us Jesus, looking at him, loved him and spoke.” Somehow, despite his self-assurance, despite his remarkable confidence in his own spiritual maturity, Jesus loves this young man. Just like He loves us. There’s only one authentic response to that kind of love: gratitude. Our Savior tells him, “You lack one thing; get up, sell what you own, and give the money to the poor, and you will have treasure in heaven; then come, follow me.” That phrase Jesus uses, “get up”, it’s a phrase often used in the stories of Jesus healing people. 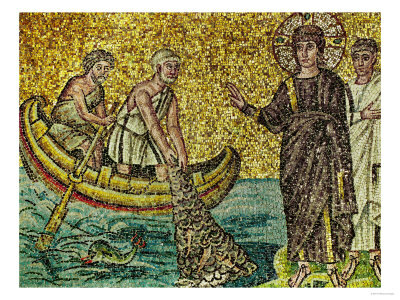 In Capernaum, when Jesus heals the paralytic, he tells him to “get up, take your mat and go home.” In the 5th Chapter of Mark, when he casts demons out of a man by the shore, he tells him to get up and go home and tell your friends what God has done for you. He uses the phrase again and again. And so, we begin to wonder, is Jesus trying to heal this man, too? Yet, like so many of us, this man can’t take this teaching. Scripture tells us: “When he heard this, he was shocked and went away grieving, for he had many possessions.” Jesus often taught about the cloud that our possessions, our wealth, place over our spiritual lives. The only subject he talked about more was the Kingdom of God, and in today’s reading He talks about both. I want to suggest to you that one reason that young man went away sad is that he had betrayed his own true nature. You know, it’s one of the first things we learn about God in Scripture. He gives us a world, he gives us a garden, he gives us freedom and gives us a promised land to live in, and then, he gives us a son. God is by nature a giver, a giver who teaches us again and again how to be generous. Each breath I draw, I draw because of God. The car I drove up here in this morning, very early this morning, that came from God. Someone might say, “No, that car came from the money you made at your job. That didn’t come from God.” But the simple truth is, that job came from God, as did my education, which flowed out of the parents God gave me. Praise God, from whom all blessings flow. Everything, my family, my friends, and my godchildren: all of these things came from God. You may remember that just last week, Jesus told us that to receive the kingdom of God, we must receive it as little children. Children, particularly little children, can’t make their own way in the world. Rather, most everything they have, they have gotten as a gift. Somehow, we’ve managed to forget that. In a culture that perpetuates the myth of the self-made man, we’ve forgotten that we are utterly dependent on God for our very lives. And when the Book of Genesis tells us that we are made in the image of God, I think it means, in part, that we were made to be givers. We were created to be generous creatures. And that’s part of the reason why that wealthy young man went away so sad. He had betrayed his real nature, the purpose for which he was created. He had revealed that his heart was with his treasure, the things he owned. He had denied his real nature, revealing that his heart lay in a wealth he could not part with. We might well ask ourselves, what are the things of which we are not willing to let go? What’s getting in the way of our relationship with the God who sustains our lives in every moment? This young man who came up to Jesus lived in a world of scarcity. Perhaps he wondered, who’ll take care of me when I’m old, or what happens if the economy takes another turn for the worse? You see, it’s largely a question of who we trust. Do we trust in our real estate holdings, our financial institutions, or our ability to make a living, or do we trust in the God who spun the world into existence? Learning to give is important for our spiritual lives, in part, because it’s a matter of learning to trust. Like many of us, this rich young man comes to Jesus with reverence, but without much trust. On the other hand, most of us know that giving is in our very nature. We give to our children, our spouses, our friends, and this giving brings us joy. When we give to the Church, however, we also engage in a liturgical act. We know that our word liturgy means “the work of the people.” It is a private sacrifice for a public good. And so, when we write those checks on Sunday morning, it’s not the same thing as writing a check to the grocer, or the dentist, or the landlord. Our giving to God becomes a sacrament, just like the sacrament we’ll receive at the altar shortly. And we’ll gather those offerings together, and ask God to take them and make something holy out of them. And in that, I hope we also can find our joy. As a congregation, our treasure reveals itself in all sorts of acts of liturgy, acts which are both spiritual and material. When we baptize a child or tend to the sick or serve food in a shelter, we are make an offering of a materialism of the sweat and tears of our days, not a materialism of furniture or jewelry or 401ks. Becoming a disciple of Jesus means that we have been adopted into this new life. Our giving, our charity, is both a spiritual event and a denial of the materialism that the world embraces. We choose a radically different kind of materialism. In that sacramental moment, as we make our gifts to God, I hope we can hear Jesus’ voice, wondering if we might do just a little more, just as he asked that rich young man to do so long ago. When you hear the words: “Peter, do you love me?” [John 21:15] imagine you are in front of a mirror and looking at yourself. 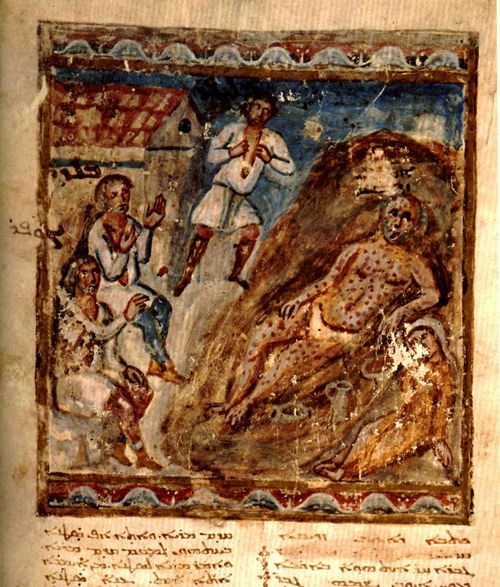 Peter, surely, was a symbol of the Church. Therefore the Lord in asking Peter is asking us too. Has only one man received those keys? Christ himself explains what they are for: “Whatever you loose on earth will be loosed in heaven.” [Matt. 18:18] If these words had been said only to Peter, now that he is dead who would ever be able to bind or loose? I make bold to say that all of us have received the keys. We bind and loose. And you also bind and loose. Whoever is bound is separated from your community; he is bound by you. When he is reconciled, however, he is loosed, thanks to you because you are praying for him. My travel schedule remains quite hectic, so once again this will be a short post. I found this bit of wisdom in Thomas Spidlik’s wonderful little book, Drinking from the Hidden Fountain. I think Augustine points out several things that matter a great deal for our spiritual lives. As we read Scripture, we should read it as if Jesus were speaking to us personally. Jesus wasn’t only explaining to the a first century audience about the kingdom of heaven: He was speaking to you and to me. I think too often we think of the keys to the kingdom as something that Jesus left as an inheritance to Peter, or to the Twelve, and perhaps we might even go so far as to think our clergy have inherited it. Augustine suggests, and I believe, that those keys are our inheritance, yours and mine. So, when I withhold forgiveness from my brother or sister, I hold that sin bound. (I think one could seriously question exactly who is bound up when forgiveness is withheld, but perhaps we’ll talk about that another time.) On the other hand, each of us have the power to loose our brothers and sisters. We can loose them by forgiving them; we can loose them from the burdens they carry; we can loose them by righting an old wrong or through our acts of charity and kindness. Jesus left us these keys, left them to you and to me. So, I wonder, what locks will we open today? Then his wife said to him, “Do you still persist in your integrity? Curse God, and die.” But he said to her, “You speak as any foolish woman would speak. Shall we receive the good at the hand of God, and not receive the bad?” In all this Job did not sin with his lips. Job 1:1; 2:1-10. In the Old Testament reading, the Lectionary leads us to the Book of Job, a vastly rich and yet deeply challenging selection. Virginia Woolf once famously said, “I read the book of Job last night. I don’t think God comes out of it well.” I have felt the same way on occasion, but we should remember a number of things as we reflect on this marvelous book. Many of us have wondered why the wicked or the godless prosper, while good people sometimes seem to carry insurmountable burdens. The Book of Job reflects on the latter issue. Jesus also addressed this issue when He said, “I say to you, Love your enemies and pray for those who persecute you, so that you may be children of your Father in heaven; for he makes his sun rise on the evil and on the good, and sends rain on the righteous and on the unrighteous.” Matt: 5:44-45. We should also remember that this book was written sometime between the 6th and 4th centuries before Christ. By that time, the chosen people had already endured slavery under the Egyptians, the Assyrian exile and the Babylonian exile. They had seen the destruction of the Temple, which for them constituted the intersection of heaven and earth. Having suffered through slavery, famine, conquest and separation, they might rightly have wondered: chosen for what, exactly? So, we have this text before us in which God appears to enter into a wager with Satan. It’s also important to remember in Hebrew the word Satan isn’t a name; it’s a title or a function. It meant something like the accuser, the prosecutor, or the adversary. If we read this work as a parable, rather than a history, it might have something to teach us about the kind of accusations that get tossed about when we (either as individuals or as a people) find ourselves engaged in spiritual warfare. And we might take a little comfort from the idea that God seems to have a remarkable faith in Job’s (and perhaps our) ability to weather life’s storms. When The Adversary strikes Job down with a hideous disease, and Job’s wife questions his “foolish” commitment to God, Job’s response resounds in our hearts. He says “Shall we receive the good at the hand of God, and not receive the bad?” That question will echo throughout the rest of the book of Job. Job answers what some have called the Prosperity Gospel, the notion that “good things happen to good people” (and implicitly therefore, bad things happen to bad people). We still hear the ruminations of that today in modern Christianity, and Job calls it what it is: balderdash. I hope to come back to Job again soon. I think the pearl is well worth the dive. Despite it’s childlike opening, the Book of Job offers us anything but a fairy tale. The book of Job sets out the struggle of faith, a struggle against faithlessness in the confrontation of pain and anguish. We find Jesus engaged in that same struggle on Golgotha as he cries out “Eli, Eli, lema sabachthani” (My God, My God, why have you forsaken me)? I think, at some time, most of us will find ourselves in that struggle, and we rightly pray to be saved from that time of trial. My travel schedule remains quite busy, so today’s post will be short. Today is the feast day of St. Thérèse of Lisieux, a Carmelite nun who lived a short life from 1873 to 1897. …and every single day a fresh beginning.